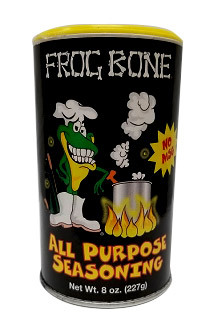 Home > Search A-Z > Frog Bone > Frog Bone All Purpose Seasoning, 8 oz. Substitute salt & pepper with our ALL PURPOSE SEASONING. 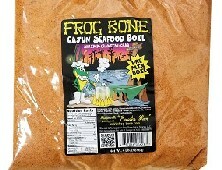 Frog Bone All Purpose Seasoning is a substitute for salt and pepper. This cajun seasoning is full of flavor with a wonderful blend of spices to increase the flavor of any steaks, burgers, chicken, eggs, gumbo, soups, rice dishes, seafood and many more dishes. Frog Bone All Purpose Seasoning contains NO MSG and Gluten Free.